Nero 8 2 8 0 h33t dinguskull Torrent Downloads - download free torrents! Nero 8 Ultra Edition is a software solution that brings the digital world to your PC with features that make it fun and easy to create multimedia projects with high-quality, professional results. Create MP3 mixes and edit vacation videos in high-definition format. Share content around the world with simple Internet upload functions. Burn a disc with just one click, and then enjoy it in any room in your house with versatile streaming features. Rest easy knowing your data is safe in the event of a system crash or a damaged disc. Nero 8 Ultra Edition lets you live the digital life with cutting-edge technology and world-class features. Using Nero 8 Ultra Edition you can now create and edit, convert and share, rip and burn, backup and protect your digital media, all from one easy-to-use interface! Nero 8 gives you freedom when it comes to creating and editing your audio, video, and photo files. Edit vacation videos in High Definition (HD), create dynamic slide shows from family photos, and make a cool MP3 mix to take on the go. With a broad range of professional tools, innovative features, and cutting-edge technology, Nero 8 helps you get the most out of your audio, video, and photo files. With Nero 8 you can format DVD content to view on an iPod or PSP, enjoy blue laser content without a blue laser burner, and import and share your favorite photos and videos with one click to and from online communities like My Nero, YouTube, and MySpace. Nero 8 makes it easy to live today’s digital life! Experience the finest in home entertainment. With Nero 8 you can stream your multimedia data to an Xbox 360 or a PlayStation 3 to enjoy in every room in the house. Use your PC to record your favorite TV shows, and use the time-shifting feature so you never miss another episode! 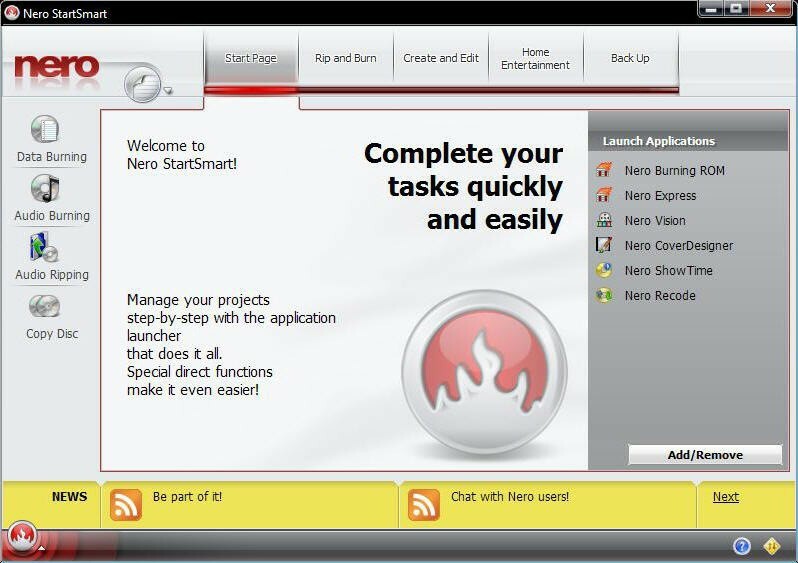 With Nero Burning ROM 8, the world’s most powerful burning application, you can rip your non-copy-protected CDs and DVDs and burn data and audio files to CD, DVD, Blu-ray Disc, and HD DVD. With the integrated SecurDisc technology, you can create password-protected discs or a digital signature to ensure the authenticity of your documents. No more worrying about losing important files! Integrated SecurDisc technology and the advanced backup features in Nero 8 give you peace of mind knowing your data is safe if your system crashes or a disc gets damaged. User-friendly wizards make it fast and easy to back up, restore, and verify your data, and customizable automation features allow you to ensure backups happen on time. · Internet connection required for registration, free online activation of full DVD, MPEG-2, MPEG-4 and AVC functionality, product updates, and other features such as photo sharing. · TV tuner or video recording card for analog or digital recording, time-shifting and any TV functionality.